The Blue Cube TempoTrack has been designed for use on flotation cells to measure the froth velocity, depth of froth overflowing from the weir and froth stability. The Blue Cube TempoTrack can be used in conjunction with the Blue Cube MQi Slurry Analyser for control purposes or used independently for process monitoring and control. When used together with the Blue Cube MQi Slurry Analyser, the Blue Cube TempoTrack can be installed on the flotation cells from which the concentrate measured originates. If the Blue Cube MQi Slurry Analyser for example measures the concentrate of a bank of three re-cleaner cells, then having a Blue Cube TempoTrack on each of the three cells will allow either the operator or the controller to identify if a decrease in grade (increase of impurity) is due to the sliming/pulping of one of the flotation cells. Appropriate corrective measures can then be taken. It also reliably identifies any cells that are not pulling. 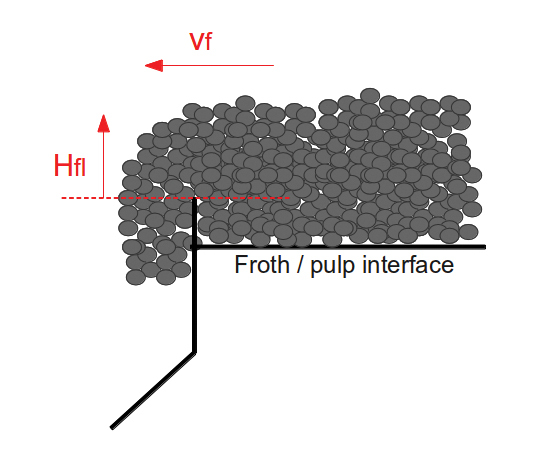 This enables the calculation of the relative air recovery per unit cell lip length. The Blue Cube TempoTrack units are insensitive to environmental changes and are connected by a mesh wireless network to a single dual communications gateway that provides a Profibus connection to the PLC. The Blue Cube TempoTrack can be used in conjunction with an installed MQi Slurry Anlyser or used independently for the control of a bank of flotation cells. When used together with the Blue Cube MQi Slurry Analyser, it can determine the significance of the contribution from each of the flotation cells to the slurry composition. Click here to view the Blue Cube TempoTrack brochure.